GONNA BE A LONG WEEK! Based on what the Municipal Calendar tells us tonight, it's going to be a very busy week in Costa Mesa. I'll give you a little taste with this post so you can decide if you want to make any of the meetings, but I'll write about each of them separately in greater detail, too. 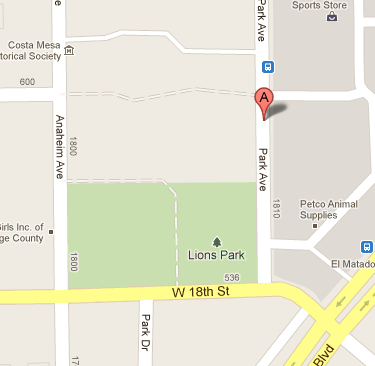 Yep, the Costa Mesa Planning Commission meets again on Monday and you can read the agenda HERE. In addition to three separate developments totaling 51 new units in the city to be considered, there's also a report on the "Operational Status of the Code Enforcement Division for the 2014/2015 fiscal year". There are actually two separate meetings of the Costa Mesa City Council on Tuesday - normally an off-day for this group. First, at 6:45 p.m., there will be a Special Closed Session about an un-named potential litigation issue, HERE. Then, beginning at 7:00 in Council Chambers, there will be a Special City Council meeting, HERE. There will be one item on the Consent Calendar - the amendment of a professional services agreement that was shoved off to this meeting from the last one because Councilwoman Sandra Genis would have had to recuse herself, which would have left them without a quorum. The main reason for this meeting is the adoption of the 2015/2016 $147 million Municipal Budget. We'll cover that later. I just hope we actually have a quorum for this meeting this time. 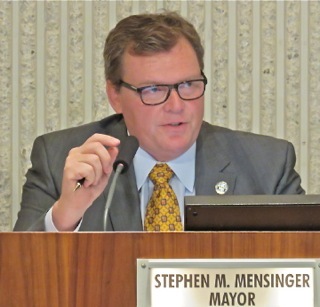 The Costa Mesa Parks and Recreation Commission will meet in Council Chambers beginning at 6:00 p.m. on Thursday, June 25, 2015 for the first time in a couple months. You can read the agenda HERE. We'll talk about that more later, but the big item looks like Item 9a, the Field Use Allocation and proposal for special treatment of certain user groups. The final community outreach effort by the consultant architects and others working on the plan to improve library facilities at Lions Park is now complete. I've written about previous meetings HERE and HERE. 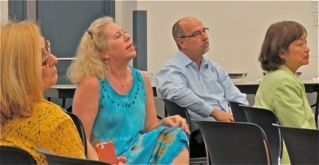 Last night fewer than three dozen residents attended the final workshop to hear about the progress made so far and to provide input to the consultants as they prepare to offer their findings and recommendations to the Costa Mesa City Council sometime in July. Recreation Manager Travis Karlen kicked off the evening right on time by introducing consultants Steve Johnson and Jim Favaro, who took over from there. Favaro gave a recap of the earlier meeting, reminding us why this project was launched - the shortage of library space - and spoke about the poor condition of the two existing buildings in question, the Neighborhood Community Center and the Donald Dungan Branch Library. He also provided us with a timeline of progress so far. 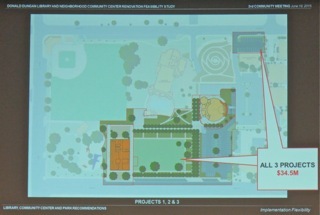 Johnson took over and led the discussion about the alternatives - to renovate or rebuild each of the facilities. He talked about the relative costs of each step, whether renovating or rebuilding, and provided a sequence of events that could be followed. Each of the images below shows phases that could be taken. In order, the first project - building the new 2-story library building adjacent to the existing NCC could happen and the entire process could stop there. 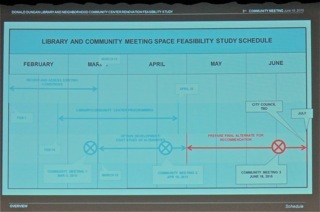 The next phase would be the rebuild/renovation of the existing Donald Dungan Library into a community meeting facility - and the process could stop there. 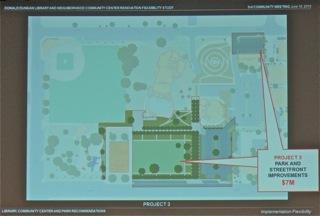 The third phase would be the completion of the parks/parking changes. All three projects, when completed, would cost over $34 million, building in factors for cost increases over the time period. Some significant assessment of the parking situation has been done. The results, with the addition of 15 spaces near the Historical Society building and adding a few more spaces along Park Avenue, actually resulted in a net increase of 1 space over the current number. 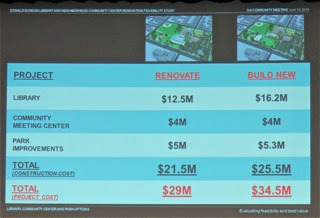 This chart shows the cost estimates to build/renovate each building/project. The "Total Project Cost" includes the furniture, fixtures and technology infrastructure necessary to complete the projects. 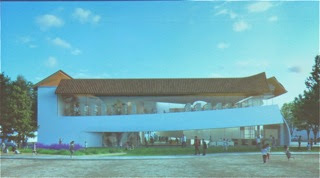 These two images are artist renderings of a possible look to the new library building. 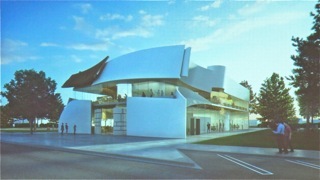 The first one is viewed from Park Avenue. This view is from approximately the location of the airplane at Lions Park. A dozen members of the public stepped up to the microphone to offer opinions or ask questions covering a wide range of issues. 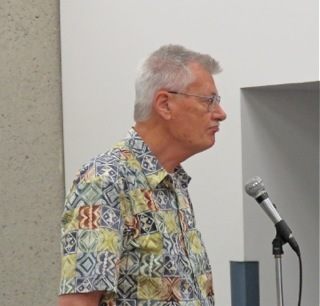 Library supporter Art Goddard was the first to speak and he expressed concern about the anticipated cost of this project as viewed by the consultants. He expressed concern that the community would lack the will power to move forward with such an expensive endeavor and looked to the consultants for ideas about a scaled-down project, utilizing the existing buildings. He phrased it as "Option Zero" - where much less would be done and still improve our library situation. The answer given was that the financial threshold was so low - $100,000 - and the change of use from a meeting room to library was viewed by the government regulations as so significant that major changes to the building - the NCC - would be mandated. 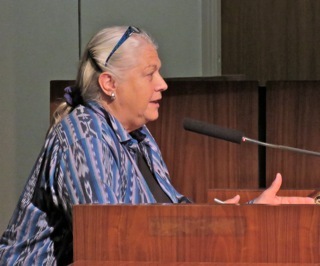 Resident Kathy Esfahani expressed concern about the loss of the use of the NCC by long-time user groups and was told that the City had "granular data" on how the facility was used. Earlier we were told that it was only used to about 1/3 capacity about 1/3 of the time. Steve Johnson told us that the four major users of the NCC were consulted during their planning process. We were also advised that the City had much more meeting space available around town that was being significantly under-utilized. 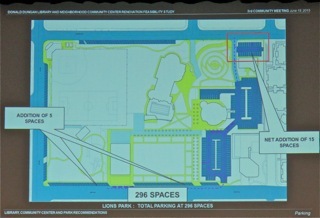 The plan would be to end up with about 8,000 square feet of meeting space between the two new proposed buildings. 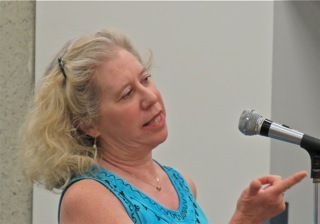 Uber-activist Beth Refakes - who attends more meetings than anyone else I know and takes great pains to make carefully-crafted observations, comments and suggestions, addressed several issues. Speaking about the open space on the plans, she observed there had been moves afoot to use space in Lions Park as a skate park and/or sports field. She wondered about the costs. She observe that the proposed design was not compatible with other nearby buildings - citing The Triangle and The Courtyards, right across the street. She opined that the relocation of the recently-refurbished airplane would be a bad idea. Johnson agreed and that was off the table at this point. She also observed about the NCC that she attends meetings there frequently and it's "always busy". She also observed about the shortage of parking NOW, and that some of the nearby neighborhoods have resident-only parking. CEO Tom Hatch sat quietly in the audience with others, listening to the presentations and the questions. He heard others ask about how long the project might take - two years was the answer, assuming certain mileposts could be met. A question was asked about the budget - the financial target for this project - that was originally given to the consultants, because early conversations led us to believe it might be in the $5-7 million range. The answer was that they were just working at the direction of their client - the City. Others expressed concern about the building design - not meeting their personal preference. 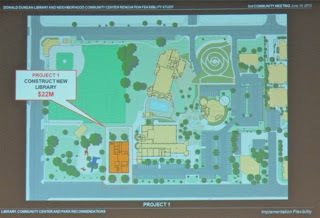 A question was also asked about alternative sites being considered for the community meeting facility... none were. At the end of the meeting Hatch wrapped it up by making several observations, some of which seemed relevant and others just seemed kind of off the wall. He spoke of his gratitude to the members of the community who participated in this process. He was surprised at the cost projections, which took him off into a kind of stream-of-consciousness exposition of capital projects and sales tax. He explained that sales tax - primarily from South Coast Plaza and the car dealerships - account for 46% of the current budget revenue, and that it could be a capricious (my word) source if income. He emphasized that we shouldn't plan on it always being there - and cited the economic downturn earlier in the past decade. He mentioned that this budget will set aside 6.5% of the General Fund budget for Capital Improvements, then talked about the needed repairs and replacement of Fire Stations. He said we set aside $1.6 million toward Fire Station #1, but that it would need $7-10 million to rebuild it. 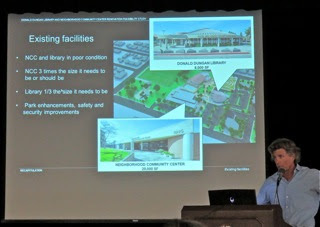 He mentioned other city-owned facilities, indicating the Mesa Verde Branch Library had immediate needs, but that the Senior Center was OK for now. Then he said something peculiar - that "if the City Hall remained where it is, it would require another $5-10 million to make it work for another 50 years". I found myself wondering where that thought came from? He then found himself talking about the Victoria Street widening project that was funded by bonds that were still being paid off at the rate of $1.2 million a year for the next four years, and suggested perhaps a library could be built using similar funding mechanisms. He seemed to be saying we could just plan on paying that $1.2 million downstream after the Victoria Street bonds were retired. He talked about "front-loading" the cost as much as possible. An observation... Once again, veiled comments were made by the consultants that the placement of a new library situated as they showed it could some how magically resolve the problem of the homeless folks who currently infest the park. When I arrived at around 5:45 there were more than 40 people stretched out on the grass throughout the park area. When I left at around 8:30 there were fewer, but not many fewer. There seems to be a thought that having windows facing the airplane section of the park will somehow discourage homeless folks from hanging out there. However, there has never been any kind of anecdotal evidence to that fact. In fact, I'm told by those close to the situation that the opposite is true - that homeless folks near the Historical Society building actually "perform" for the "audience" in that building from time to time. I found it distracting to the discussion of the other issues. The meeting ended with Karlen offering a tour of the Dungan Library building. I didn't see if anyone took him up on it or not. So, now we just wait to see what the consultants present to the City Council in a month or so. It's hard to imagine that this meeting will not find itself in the budget discussions on Tuesday evening, when the 2015-2016 Fiscal Year Budget is approved. We'll see. 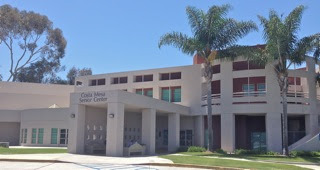 This morning Scott Carroll, General Manager of the Costa Mesa Sanitary District, and Mike Silva from CR&R Environmental Services presented the final public outreach workshop to a very small group of seniors at the Costa Mesa Senior Center. Fewer than a dozen of us geezers showed up to hear their presentations, but we all stayed awake and asked good questions. Each of the other four recent meetings played to packed houses - in a couple cases standing-room-only - so this turnout was not unexpected. 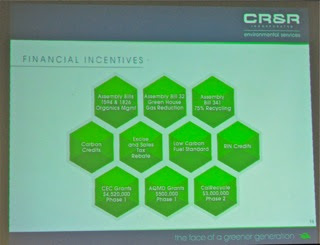 Although I've attended the earlier version of this presentation several times, this is the first time for me to hear the current pitch, with the current numbers. I'm not going to bore you with all that stuff - you can visit the CMSD website, HERE, which has ALL the information you'll need to know about this change in how our residential waste will be handled. 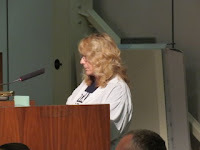 There's a link on the website to an excellent video presentation from the Town Hall held on June 2nd, too. In a nutshell, instead of just dumping all our household waste - trash, green waste, recyclables, etc. - into a single cart each week as we do now, once the new carts are delivered over the next few weeks we will be required to sort our waste. 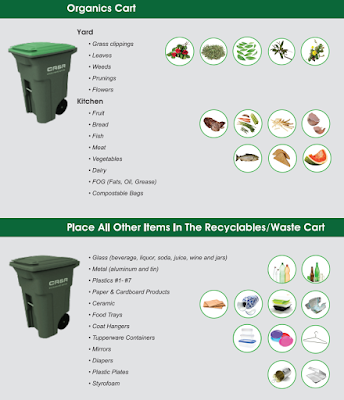 Green waste and food scraps will go into the new cart - the one with the light green lid - and everything else will go in the old one. As Silva said in response to one of the questions today, "Don't overthink it." This new process - the CMSD is the first company to sign up with it and, as a result, will ALWAYS have the lowest rate for this process - will end up costing each ratepayer about $1.72 per month. That charge will be assessed on your property tax bill. 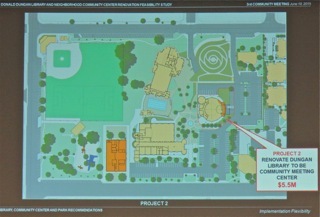 The new facility in Perris will eventually end up costing around $100 million when fully built-out. The initial phase, which will be processing our waste, will cost around $30 million, part of which will be offset by grants received. 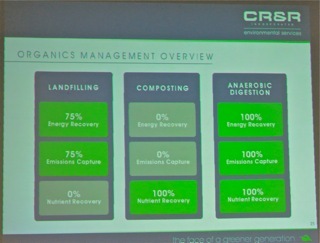 The objective is to reduce the stuff being taken to landfills. We are running out of landfill space. 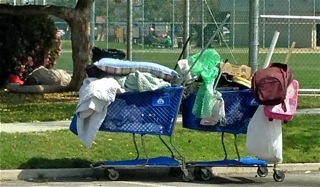 Presently Costa Mesa diverts over 50% of it's trash from landfills. The goal of this process is to divert AT LEAST 75% once it's implemented. I've provided some slides from the presentation. 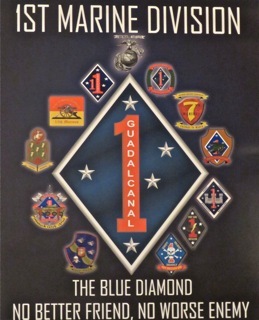 These and others are shown in the video presentation. If you're really interested, take a few minutes to watch it. The direct link to it is HERE. On the way home I stopped at the CMSD offices at 628 West 19th Street - kind of just across the street from the Senior Center - and picked up my brand new counter top, dishwasher-friendly food scrap bucket. If you choose to use one of them, the CMSD has them for free. Or, you can just wrap your potato peelings, steak bones and other food waste in newspaper and toss it into your Organics cart. 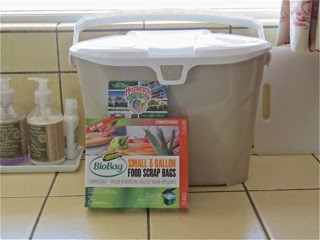 Then I stopped at Mother's Market at the corner of 19th Street and Newport Boulevard and got a box of COMPOSTABLE bags to line the bucket. 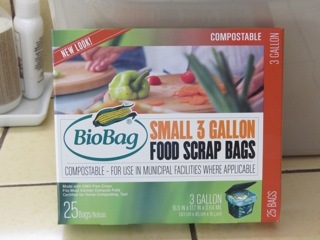 Similar products are marked "biodegradable", but should NOT be used in this process. You can use newspaper if you wish, but I wanted to be sure Mother's actually had this product on hand since the CMSD information lists it as a supplier. I chatted with the managers and told them to stock-up! This box of 25 cost $5.00. I showed the gift card, since that might be a nice gift for your friends... give them a $5.00 gift card and they can buy a box of bags. 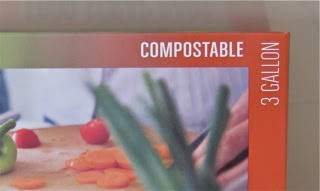 And, per the conversation today, if you choose NOT to put your food scraps into the new Organics Recycling cart, it's OK. There will NOT be trash police patrolling the streets, inspecting your trash. Here's a nifty chart from the CMSD website that shows what kind of waste should go into which cart. What WILL be happening, though, is that we'll have twice as many trash truck trips through our neighborhoods. One truck will pick up your trash, while another will pick up only the Organics. If you're only using one can each week now, soon you'll be using two. The schedule for distribution of the new carts is shown on this nifty chart, HERE. It's a PDF file and looks like this, but much bigger. So, neighbors, the distribution of the new carts begins next week through August 14th and the collection of trash using them will follow the next week after distribution. If you need another Organics cart, just call the CR&R at 949-646-4617. Tomorrow is another busy day in Costa Mesa... what's new?! 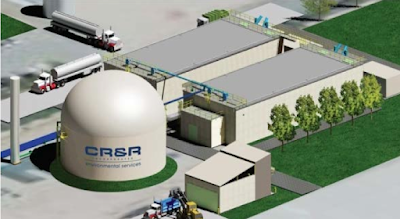 First, tomorrow, Thursday, June 18, 2015, there will be the final public outreach meeting by the Costa Mesa Sanitary District on the plan to implement an Organics Recycling program in Costa Mesa. There have been several public meetings on this subject, stretching back well over a year. This one was added as a special outreach for the Costa Mesa Seniors who may not have had a chance to make any of the others. This meeting will be held at the Costa Mesa Senior Center, 695 West 19th Street and begins at 10:00 a.m. CMSD General Manager Scott Carroll will provide the information and will likely be accompanied by representatives of CR&R Environmental Services - our trash hauler. 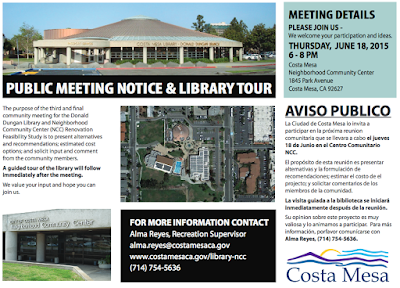 If you cannot make the meeting and still need information there is plenty available to you at the Costa Mesa Sanitary District web site, HERE. 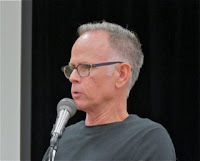 Included there is an excellent video shot by Barry Friedland of Costa Mesa Brief of the June 2, 2015 Town Hall meeting. You can link directly to that 75 minute video HERE. 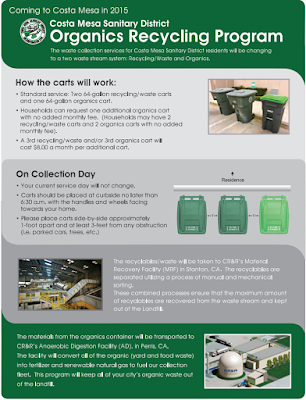 The new trash carts will begin being delivered to CR&R customers beginning next week and will be distributed on a rolling cycle through August 14th. Click HERE for a map of the distribution schedule. 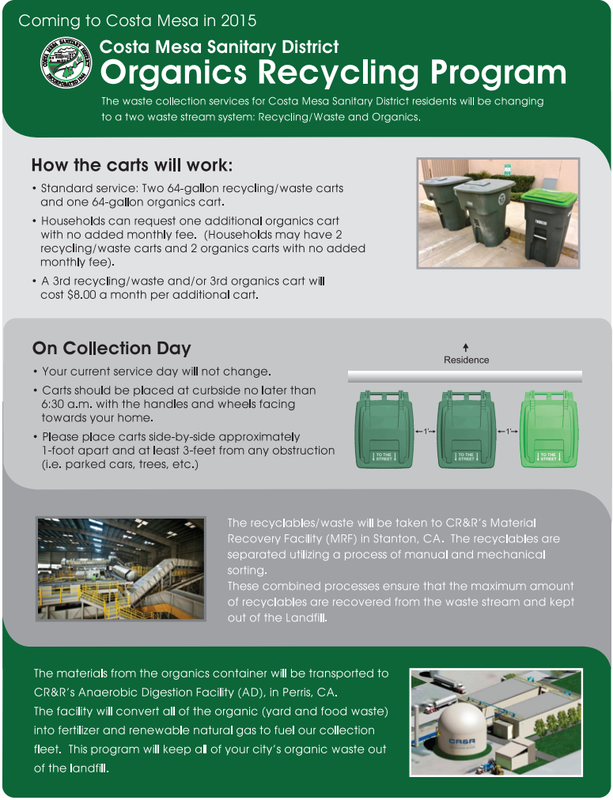 The Costa Mesa Sanitary District will also have free counter-top waste food buckets available for pick up at their offices at 628 West 19th Street in Costa Mesa. For more information call the District at 949-645-8400. 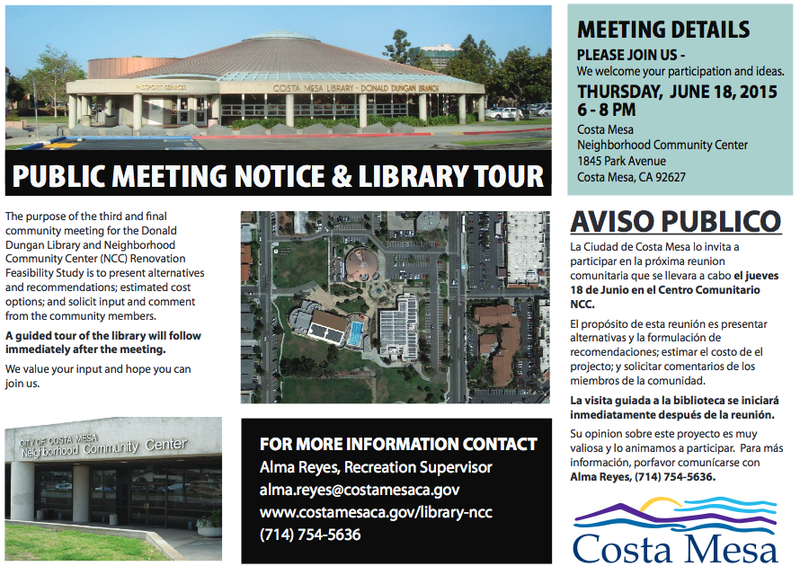 Then, tomorrow evening, there is another meeting about the Library/Neighborhood Community Center project - that will discuss the options for the expansion of Costa Mesa's library capacity - that will be held at the Neighborhood Community Center, 1845 Park Avenue (Lions Park) from 6-8 p.m. There will be a tour of the Donald Dungan Library following the meeting. Here's the information on that one. Click on the image to enlarge it. 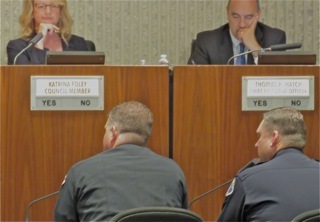 Sunday I wrote about the Costa Mesa City Council meeting, HERE, and included my thoughts on some of the agenda items. Way, way down at the end I predicted the meeting would end at 9:32 p.m. Well, I blew it! I underestimated the impact of a Jim Righeimer-less meeting. 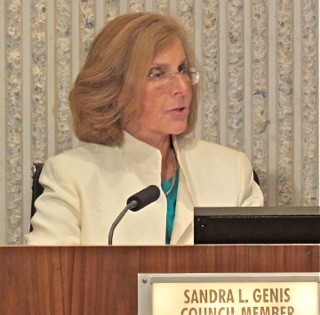 After all was said and done, the meeting closed at 8:17 p.m. when Councilwoman Sandy Genis closed it in memory of long-time City Finance Department employee Sheri Sanders - a lovely, sweet woman who passed away recently after a short illness. 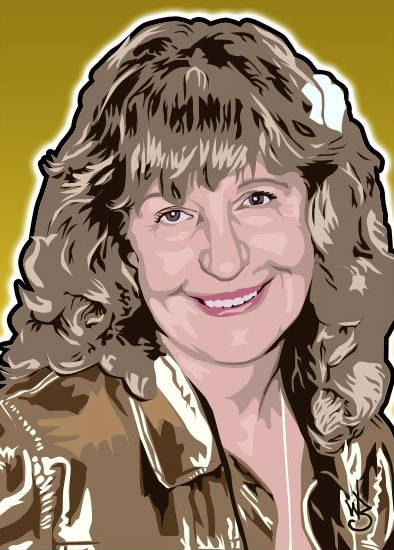 I knew Sheri a little bit - she was always upbeat and helpful. I miss her special laugh. I borrowed this image - created by her friend, Bill Bricker, a few years ago - from her Facebook page. It just seemed to capture the essence of Sheri. The meeting began with barely a quorum. Both Mayor Pro Tem Righeimer and Councilman Gary Monahan were absent. Mayor Steve Mensinger began the meeting with a presentation to Pete Carolan, a local guy and an American Hero in many ways. 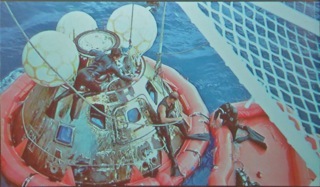 The staff had prepared a video presentation showing clips of his life - as a OCC water polo player, Navy Seal with a tour that included being the lead swimmer that retrieved the distressed Apollo 13 capsule. You can read a little more about that HERE. 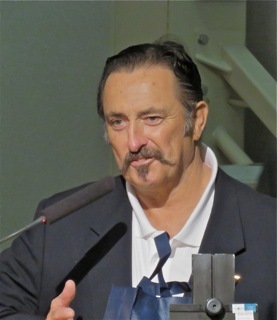 He returned to OCC, became part of a champion rowing crew. He matriculated to USC - his entourage last night included several of his cronies - and has subsequently become an artist of international repute. Recently he helped restore the airplane at Lions Park. 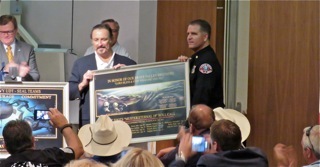 While he was the recipient of the Mayor's Award last night, he also bestowed an award on Fire Chief Dan Stefano to commemorate his life being saved recently by members of Fire Station #3. 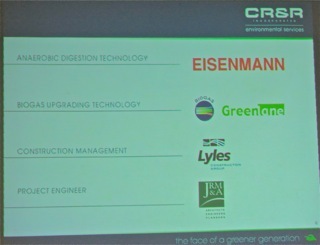 The presentations were a good way to start the meeting. 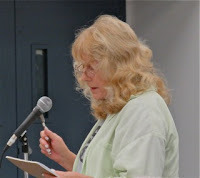 During Public Comments eight (8) people rose to address issues with the council. Tamar Goldmann stepped up and spoke about the Meet The Mayor event, held Sunday at City Hall. From all reports, it was the most heavily-attended of this series of meetings. Tamar was pleased with the conversation she had with Mensinger and soon-to-be-sworn-in Police Chief Rob Sharpnack, who gave up part of his Sunday to be at the meeting. She expressed hope that Mensinger and his majority will be of a more open mind when it comes to public safety. Former councilwoman Wendy Leece expressed concern about the budget, citing as an example of unnecessary spending the plan to replace all the bus benches in the city for around $50,000 after quoting a bible verse regarding our responsibilities to care for those among us. The replacement of the benches will be a hardship on the homeless among us. Steven Chan complimented the Planning Commission on its decision to keep the proposed Maison night club on West 19th Street closed and used his time to encourage the city legal staff to fully investigate the issue before the appeal - filed by Monahan - is heard. Former councilman Jay Humphrey drew the council's attention to a recent news article about the California Supreme Courts decision regarding affordable housing in San Jose - and pointed out that, although Mensinger recently received an award from a builders group for the 2,000 housing units built, none were affordable. Beth Refakes reminded us that there is a ball gown collection drive going on for the 1/5 Marine Battalion from Camp Pendleton, which is scheduled for deployment later this year. Gowns and gear may be deposited in the foot locker in the lobby of City Hall. 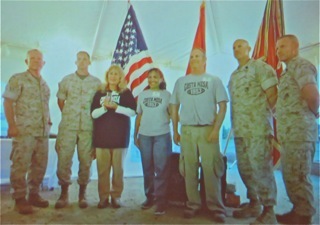 She and Teresa Drain then presented a short slide show of the recent 1st Marine Division awards luncheon at Camp Pendleton, which they and Drain's husband, Jim, attended to represent Costa Mesa as members of our Military Affairs Team. 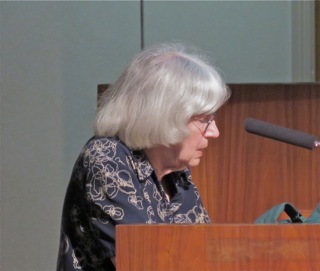 She presented a plaque to Mensinger. Karl Ahlf spoke of the need for bike racks throughout the city. Other comments were made by members of the public addressing the recent Budget meeting with CEO Tom Hatch and other staffers that didn't include input from council members. Other issues included the need for rent control by one long-term renter who has seen his rent triple in 8 years. Mensinger thanked Beth Refakes, Teresa and Jim Drain for their work on the Military Affairs Team. he then mentioned that Costa Mesan Jake Knapp will be playing in the U.S. Open Golf Tournament this weekend at Chambers Bay - a truly challenging course if there ever was one. Foley also addressed the need to get out ahead of the Fairview Developmental Center issue and asked the CEO for a report. She then thanked outgoing Interim Police Chief Ron Lowenberg for his service to the community and "helping to stay the ship". She thanked Sharpnack and officers Dimel and Johnson for their service at a recent Costa Mesa Spring Football game. 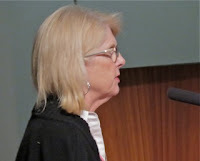 She also mentioned, as part of her comments about it being Graduation Week in the Newport-Mesa Schools, that Costa Mesa High School will have five (5) valedictorians and that all are young women and all are heading off to outstanding schools in the state. During his time Hatch also discussed the Fairview Developmental Center and the meetings that have been held and will be held. It is planned to include that venue as part of the General Plan update that's underway, citing some kind of an overlay zone for the development of that site. He also thanked Lowenberg, mentioned we have two new firefighters - and fumbled around finding their names - Austin Krie and Corey Brean, HERE. 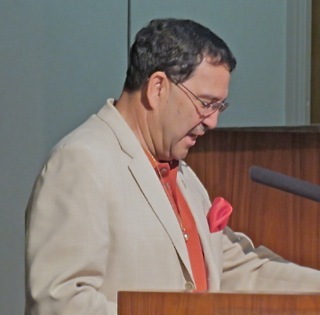 He also mentioned that the Budget will be the only subject on a Special City Council Meeting Agenda for next Tuesday, June 23, 2015, and that the meeting will start at a special time - 7:00 p.m. The Consent saw only 3 items pulled for later consideration - numbers 7, 14 and 16. As it turned out, there was still time before the magic witching hour of 7:00 p.m. when Public Hearings can commence, so they just finished the Consent Calendar. 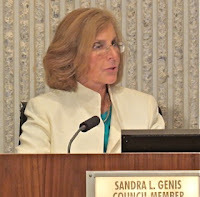 Genis asked that 14, the renewal of a contract for Keyser Marston be continued because she has a conflict and her removal would lose the quorum. She also asked that consideration be given on #16, the request to cancel the August 18th council meeting, to be adjusted so the City could participate in the National Night Out. Hatch will look into a way to do that, but the cancellation stands. Item #7, dealing with a completed alley job, was pulled in error by a resident. All except 14 passed, 3-0. 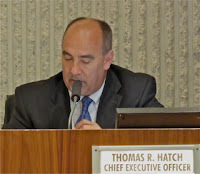 Public Hearing #1, the Civic Openness In Negotiations (COIN) hearing on the Costa Mesa City Employee Association (CMCEA) contract and side letter went quickly. Tamar Goldmann used the opportunity to discuss the need for a similar process to manage "expensive outsourcing", using one particular vendor, Lilley, who provides Temporary Management Services, as an example. Foley asked Hatch if ALL employees were included in this contract. He responded that all non-sworn employees were included except 20 "confidential" employees, but that their arrangement would follow this contract. 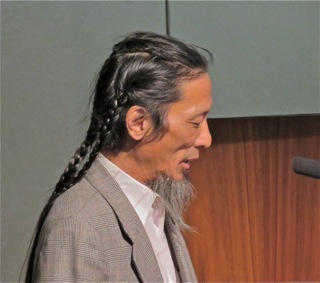 Human Resources Director Lance Nakamoto acknowledged that the numbers for those employees were included in the presentation. The item passed, 3-0, and the second hearing will be on July 7th. 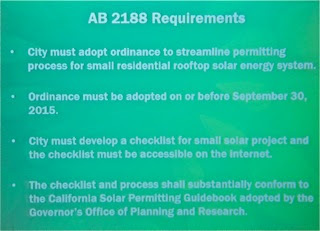 Public Hearing #2, the discussion led by Building Official Khanh Nguyen of the state requirement for Expedited Permitting Procedures for Small Residential Rooftop Solar Systems as required by AB 2188. 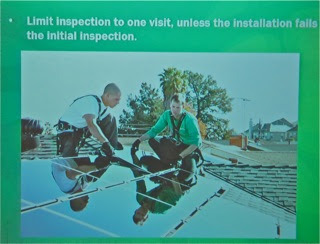 He presented a short slide show and told us, among other things, that the new law allows only ONE inspection of solar installations! We've been doing two, so he and his staff are working on procedures with installers to meet this diminished requirement. Very strange, indeed. The slides show the requirements of the law and some additional language that has been added to our new Ordinance. 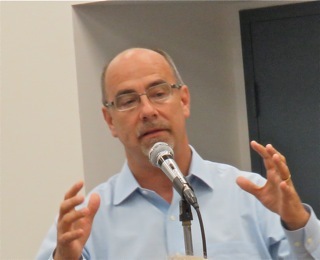 Public Hearing #3 was the very short discussion of the Appropriations Limit for this year's budget led by Interim Finance Director Steve Dunivent. This usually is done with the budget approval process, but that's not going to happen until next week. This is a state requirement. Based on the formula we are required to use, the Appropriation Limit for the 2015-2016 budget year is $201,264,174. Our budget will be around $147 million, so we're in good shape. This passed, 3-0. 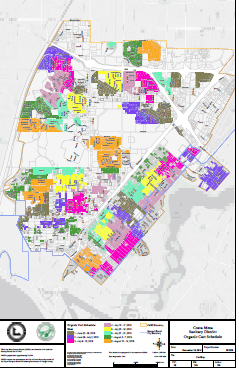 Public Hearing #4, the so-called Clean-up measure regarding the Land Use Matrix which is part of the Municipal Code dealing with Group Homes. 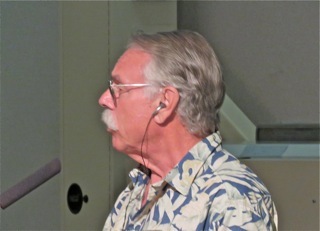 Consultant Jerry Guarrancino led this discussion. One public speaker, Ann Parker, expressed concern about the progress being made with group homes despite this ordinance - which wasn't the subject of the issue. Guarrancino gave some current statistics indicating that, contrary to Parker's assertion, there have been 28-29 citations given for violations; that 24 operations did not meet the filing deadline for permits, but many are expected to be submitted by the end of this week. He also indicated that the much-anticipated ordinance for multi-family areas is pending soon - within a couple weeks. This passed, 3-0. 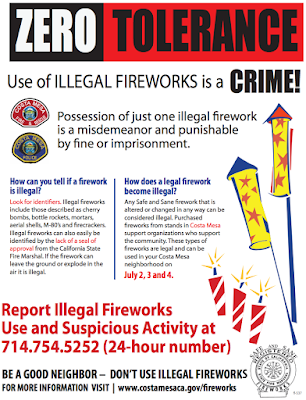 New Business #1 was the Fireworks Letter and Flyer, presented by Fire Chief Dan Stefano and new Police Chief Rob Sharpnack. 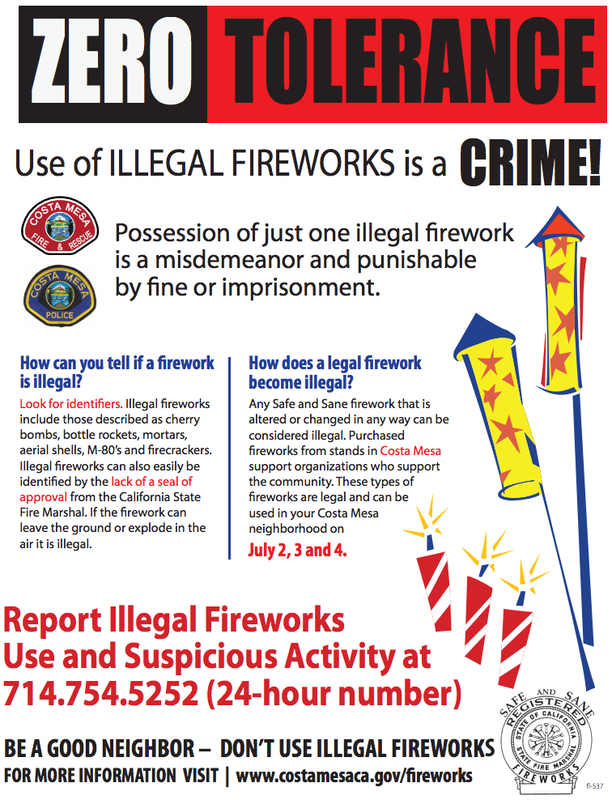 They discussed their "Zero Tolerance" plans for the three days of chaos this year, July 2nd, 3rd and 4th, and spent time on the flyer shown below. Council members expressed ideas for some changes - like showing the hours permitted for the discharge of safe and sane fireworks. Foley expressed a concern about whether this activity is really worth the time and trouble. She asked Hatch for a report this year listing how much each booster group made in net profit from the sale of Fireworks, and how much the vendor made. The clear implication was that the vendor - a major campaign contributor - may be the big winner in this whole thing. Foley is NOT a supporter of fireworks. Sharpnack told us he will have an enhanced force available for those three days, including several undercover officers out in the neighborhoods to catch folks using illegal fireworks in the act. He and Stefano are working closely together to keep the city safe on those evenings. 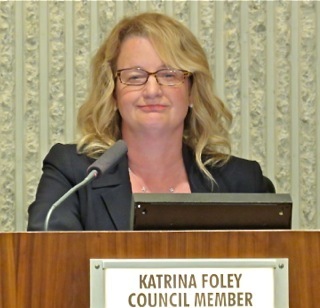 Foley expressed disappointment that NOTHING had been done earlier this year to spread the word before school was out. 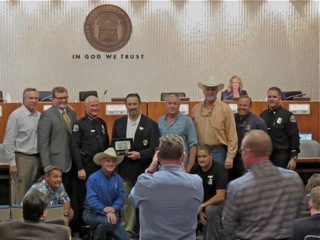 The final item on the agenda was the request for the City to match a $25,000 grant to assist with the creation of the so-called "Hero's Hall", a Veteran's Museum at the Orange County Fairgrounds. Outgoing official of the Orange County Employee Association, Nick Berardino, asked for this support recently. Bobby McDonald, Chairman of an Orange County Veteran's organization, told us that Orange County has 133,000 veterans - the second highest number of any county in the state and 6th nationwide. He spoke about the remembrance next week of the 50th anniversary of the tragic crash at El Toro Marine Airbase that took the lives of 84 soldiers headed for Vietnam. Beth Refakes asked for their support and said this was a no-brainer. Teresa Drain and Karl Ahlf also asked for the support. The council voted, 3-0 to support it and Hatch said the money would come from his contingency fund for this budget year. The meeting was closed in honor of Sheri Sanders at 8:17 p.m.